We’re here at week #5 and this week we’re featuring designer Charles Krypell. Charles Krypell is based out of New York and is internationally known for his sophisticated design work and incredibly detailed fine jewelry. He and his family visit to Windsor every year to see us and bring wonderful collections for everyone to see. It’s one thing to have quality jewelry, but our friendships with Krypells take their creations to the next level. You can see a few pieces of his collection right here. 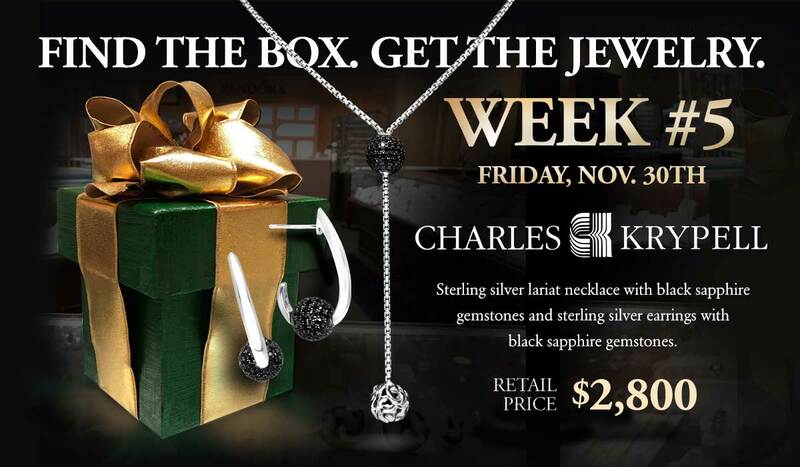 The box finder will receive a sterling silver lariat necklace with black sapphire gemstones and sterling silver earrings with black sapphire gemstones. The combination of these two items retail for $2800. If you come into Windsor and try on a piece of Charles Krypell, you’ll get to see a clue a day in advance. #1 Clue, Friday Nov. 30th :: You can exchange if there’s death within six months. In regards the sale of the Hope Diamond, the Cartier sales contract had an unusual clause: “Should any fatality occur to the family of Edward B. McLean within six months, the said Hope Diamond is agreed to be exchanged for jewelry of equal value.” Ned McLean’s mother died soon after its purchase, warning her daughter-in-law that the diamond was indeed cursed. So she had it blessed in a church. As the minister consecrated it, a huge tree across the street fell with a mighty crash as if struck by lightning. #2 Clue, Saturday Dec. 1st :: A reason for staying instead of visiting. Evalyn Walsh-McLean purchased a home in Aiken so that she could be closer to her sons who were attending Aiken Preparatory School. The edge of the school was the location of the box. It was located right at the back property line of the Aiken City Council and Aiken Prep. #3 Clue, Sunday Dec. 2nd :: Swimwear, gardening and a poodle to boot. She was known to put the Hope Diamond around her dog’s collar during lunch parties and stored it in her lingerie drawer after parties. She wore the massive diamond as decoration on her gowns and her swimsuits wherever she went and even while gardening. #4 Clue, Monday Dec. 3rd :: The place they’ll go, she wed a true pioneer. Aiken Prep was founded in 1916 by Louise Hitchcock, wife of American polo pioneer Thomas Hitchcock and mother of international polo star Tommy Hitchcock, Jr. Mrs. Hitchcock taught Aiken Prep students to play polo, and many of them became America’s greatest players in the 1920s and 1930s. Sports were important at the school, and students also played court tennis, squash and other sports unique to Aiken. #5 Clue, Tuesday Dec. 4th (the in-store clue) :: Taken from a Hindu god. Legend had it that the Hope diamond was at one time stolen from a Hindu god (statue) and hence carried a curse.